Is your favorite The Walking Dead character gone too soon? You might be in luck as the Funko Walking Dead In Memoriam Mystery Minis set honors those who were lost during the zombie apocalypse. The lineup features various subjects from previous TWD mystery releases, except this time around, each figure is given a grimly look. Unlike the traditional color format, Funko Walking Dead In Memoriam Mystery Minis uses minimal color, sticking to mostly black, white, and gray. Some characters do have a splash of red, but only as it pertains to their death, of course. Despite the distinct Mystery Minis look, a few figures resemble their (living) Funko Pop! TWD vinyls, including Abraham, Merle and Shane. While it is no secret as to which TWD characters have passed away, the Funko Walking Dead In Memoriam Mystery Minis figures are packaged in a blind-box format that is intended to keep collectors in suspense. Because of this, those wanting to complete the full set have a slightly difficult challenge ahead of them. Barring any exclusives, there are at least 20 minis to discover. Given that there are only a dozen figures per case, fans will need more than one case to collect them all, and some have tough odds. Individual figure odds are noted below. Each figure stands roughly 2 1/2" tall. 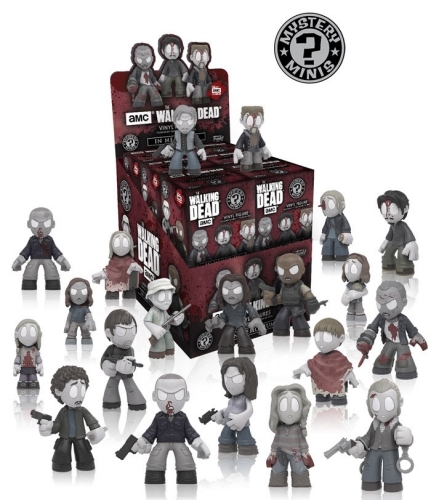 Shop for Funko Walking Dead Mystery Minis on Amazon. Funko Mystery Minis - Walking Dead and Horror - You Choose!